One of the beautiful acts we can express to another is when tragedy strikes. When someone reaches out in life’s difficult experiences it is a wonderful act of love. We see this in John 19. Two guys who up to this point in time hid their belief in Christ from others, stand up and take action. Joseph of Arimathea it states in verse 38 that he was a disciple under the radar. The power of peer pressure was great. Joseph knew he had to keep his faith quite. Nicodemus also a hidden believer, comes bringing 75 pounds of spices for his burial. How did he carry it all? Nicodemus just knew it was proper that this Rabbi would have an appropriate burial. He had come originally at night to Jesus in chapter three and now he comes in the day. Both of them making their faith public. Up to this point in time they had kept it quiet about their faith. It would have been too costly to stand up aggressively. Nicodemus had done it once in the gospel and had been shut down promptly by the Pharisees. But now the cross and Jesus’ death brought out something in themselves they hadn’t had before. They went public. They went to the authorities, who had just convicted Jesus as a criminal, and boldly asked for the body. Think of the contrast between the disciples and these two. The guys who had hidden their faith now step out in a big way. They are on Jesus’ side. The disciples who had been so public about their faith during Jesus’ ministry, now are overcome with cowardice. Ditto, Dane…Joseph was a member of the Sanhedrin…I wonder if he was the only “no” vote for the execution of Jesus. Arimathea is about 25 miles from Jerusalem; why did Joseph own a cut out tomb so close to Golgotha? Was it because he read the Old Testament prophets accounts of Jesus’ death and resurrection? 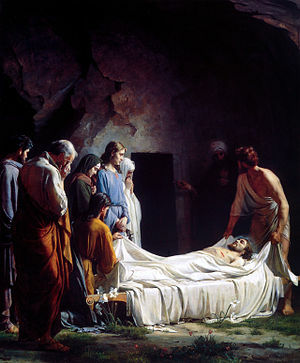 Did he believe that Jesus was the Messiah, and that He would come out of the tomb in 3 days? The disciples were scattered; Joseph and Nicodemus stepped up and contributed greatly to the resurrection story !